ORNL’s Viral Patel with his advanced ultrasonic clothes dryer. April 11, 2017—Viral Patel came to the Department of Energy's Oak Ridge National Laboratory with the aim of conducting research that would provide benefits to the average consumer, and his work has not disappointed. 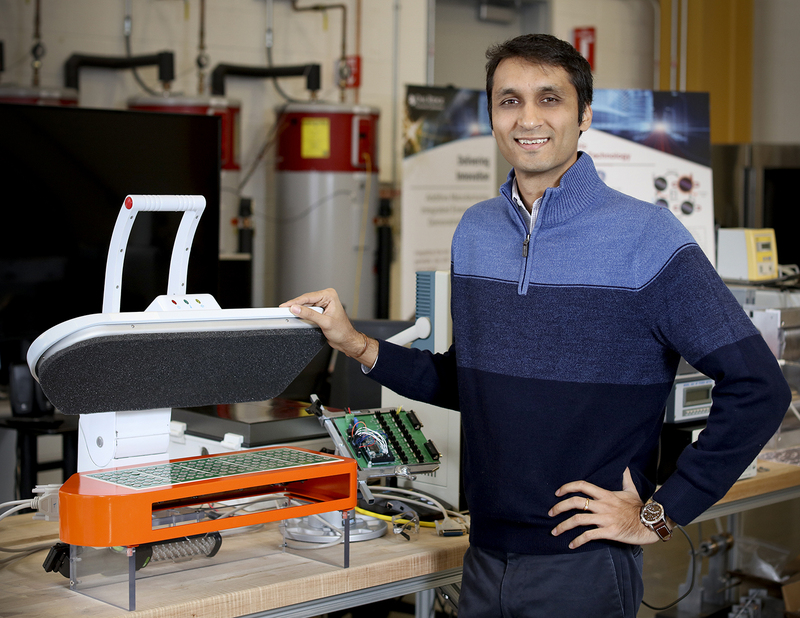 Patel jumped into three energy efficiency projects almost immediately after starting at the lab as a postdoctoral researcher in the Energy and Transportation Science Division in 2015, working on development of two clothes dryers (one ultrasonic and the other thermoelectric) and a new, more efficient rotating heat exchanger for refrigerator applications. His involvement in the ultrasonic dryer work meant Patel was often pushed into the limelight as the prototype received heavy media coverage. The project involves the use of ultrasonic transducers to nebulize water from fabric, and it was scaled up to a press-type dryer by mid-2016. The image of researchers placing wet fabric in the dryer and the resulting cascade of cold mist as the cloth was dried in seconds was a familiar one to those following the lab’s social media last year. The work continues still, with Patel and other researchers recently conducting comprehensive testing to determine overall energy efficiency of the technology. The potential for energy savings is huge; conventional clothes dryers using thermal evaporation are estimated to account for roughly 3 percent of the residential primary energy consumption in the United States. In the thermoelectric clothes dryer project, ORNL worked with industry partner Sheetak to devise an appliance using thermoelectric heat pump technology that consumed 40% less energy than typical dryers, mainly by recovering much of the energy used to evaporate water from clothes and by using a lower temperature lift. The rotating heat exchanger project has as its goal a novel, low-frost miniaturized air-to-refrigerant heat exchanger with a reduced volume and 12 percent improvement in performance over current designs for refrigerator evaporators. Patel’s research is funded through DOE’s Building Technologies Office, a part of DOE’s Office of Energy Efficiency and Renewable Energy. What drives Patel in his work, he said, is a genuine interest in helping people and improving their lives. He began his studies after moving from Zambia to the United States for college. As an undergraduate at the Illinois Institute of Technology, Patel started out in aerospace engineering. But after taking a course in thermal systems design, he decided to broaden his horizons and career opportunities with a dual major in mechanical engineering. Patel said the class was “one of those experiences that opens up your eyes to what you might be doing in the next stage of your life. It was very applications-driven. “If I hadn’t taken that mechanical engineering class I wouldn’t have met the professor who eventually became my PhD advisor,” Patel added. That professor, Jamal Yagoobi, also headed the IIT mechanical engineering department at the time, and offered Patel a position as a PhD student in his laboratory. Two years into Patel’s studies, Yagoobi accepted an offer to head the mechanical engineering department at Worcester Polytechnic Institute (WPI) near Boston. Patel also moved to WPI, where he graduated with a Ph.D. in mechanical engineering with an emphasis on thermal and fluid sciences in March 2015. Collaboration with industry and other partners such as university researchers makes working at ORNL unique, Patel said. He also enjoys how the lab encourages professional development among its post-docs, with opportunities to learn new skills and to write and present papers. “I think the assumption is that as a post-doc, the ideal scenario is that you either stay on at the lab, or if you move on to another place you’ve had such a great experience that you may come back one day, or that you will have collaborations with ORNL wherever you go,” he said. Outside the lab, Patel enjoys reading science fiction, loves to cook and travel, and spends time with friends and family. His family is spread across the globe now—on both U.S. coasts, back in Zambia, and in Australia. He tries to visit as often as he can.